EverBank Field (originally Jacksonville Municipal Stadium and formerly Alltel Stadium) is an American football stadium in Downtown Jacksonville, Florida, and the home stadium facility of the Jacksonville Jaguars of the National Football League (NFL). It also hosts the annual Florida–Georgia game, a college football rivalry game between the University of Florida and the University of Georgia, and the TaxSlayer Bowl (formerly the Gator Bowl), a post-season college bowl game. It is also one of the venues used by the United States men's national soccer team. The stadium assumed its current name on August 10, 2010, following the approval of a five-year naming rights deal with the financial services company EverBank. On July 25, 2014, EverBank extended the agreement for another ten years, to end with the 2024 season; this deal is worth $43 million. The current stadium opened in 1995 on the site of the old Gator Bowl Stadium, which had been erected in 1949. Located on the St. Johns River, it sits on 10 acres (4.0 ha) of land, including portions of the older stadium. The stadium hosted Super Bowl XXXIX in 2005 and has also held a number of college football games as well as concerts and other events . EverBank Field is located in the Stadium District of Downtown Jacksonville, which has been home to football fields since the early 20th century. In 1928 the first permanent football stadium, Fairfield Stadium, was constructed. In 1948 this was expanded and renamed Gator Bowl Stadium, in honor of the annual Gator Bowl game first played two years earlier. The current EverBank Field was built using a few portions of the historic Gator Bowl Stadium. However, all of the elements included from the older stadium — the pedestrian ramp system and the more recent West Upper Deck section of the complex — dated back only to 1982. Construction started January 3, 1994, and the new stadium opened on August 18, 1995, with an exhibition game with the St. Louis Rams. Total construction time was under 20 months and total cost was US$134 million – $60 million of which was provided by the city of Jacksonville. In January 1993, representatives from the University of Florida and University of Georgia began negotiating with Jacksonville representatives to renew the contract to host the Florida–Georgia game, the annual rivalry game between the college football teams of the two universities. The universities' five-year contract with the Gator Bowl ended after the 1994 game, and the Citrus Bowl had offered Florida and Georgia a larger sum of money than the Gator Bowl for the right to host the game. To counter the Citrus Bowl's larger monetary offer, Jacksonville mayor Ed Austin proposed a $255 million renovation plan to Jacksonville's aging Gator Bowl Stadium, which had been built in 1949. Both teams had expressed concerns about the condition of the aging stadium, and renovations were considered key to enticing the teams to keep returning to Jacksonville, bringing tens of millions of dollars in consumer spending with them. Despite the promise of renovations, Georgia athletic director Vince Dooley was unswayed, so Austin widened the scope of the renovations, increasing their price tag to $49 million, and traveled to Athens, Georgia, to talk with Dooley in person. Austin's campaigning was partially successful. On March 23, 1993, the two universities announced they had signed a five-year contract with the Gator Bowl, running from 1997 to 2002. The contract was contingent on Austin successfully passing the $49 million renovation bond issue through the Jacksonville City Council and the city completing the renovations by the 1996 game. On Tuesday, May 11, the Jacksonville City Council approved a $219.5 million bond issue, including the $49 million for the renovation of the Gator Bowl. Soon after the approval of the bond issue, investors interested in attracting a new National Football League team to Jacksonville requested that another $30 million be added to the $49 million renovations in order to make the stadium more attractive for a professional team. That number climbed higher throughout the summer, and eventually the city reached an agreement with the leading group of investors hoping to attract an NFL team to Jacksonville. On July 1, the city and investors reached a lease agreement contingent on the city investing $112.3 million for improving the Gator Bowl. The lease agreement later collapsed when the Jacksonville City Council voted to send the lease back to a committee for further study rather than approving it. One month after the proposed deal fell through, city officials and investors tried again and were successful in negotiating a deal that included a pledge to spend $121 million on renovations to the Gator Bowl. Due to the expanded renovations, it was announced that the 1994 Florida-Georgia game would have to be moved out of the Gator Bowl, as had the 1995 game, in order to provide time for the newly expanded renovation plan to be completed before 1996. In the end, the expanded bond issue and renovation program proved to be successful, as Jacksonville was awarded the 30th NFL franchise—the Jacksonville Jaguars—on November 30, 1993. Almost as soon as the celebration surrounding Jacksonville's new NFL team died down, however, a renovation contractor's plan to give 8% of the stadium work to minority-owned businesses drew criticism. The NAACP and another group said African-American businesses should have been awarded twice that amount of work. The stadium's re-opening day was also the home debut of the Jaguars during the 1995 NFL season. It was the first time that an expansion NFL team had played its first game in a new facility. The Gator Bowl returned as a New Year's Day bowl game on January 1, 1996, following the 1995 NCAA season. The stadium contains 11,200 club seats, 88 luxury suites, and 1 super suite. In 1997, the stadium changed its name to Alltel Stadium after naming rights were acquired by Alltel, a telecommunications company best known as a wireless carrier. The name Alltel Stadium stopped being used by the city after January 2007 when the contract expired. In 2005, the stadium hosted Super Bowl XXXIX in which the New England Patriots defeated the Philadelphia Eagles 24–21 in front of 78,125, the largest Super Bowl in attendance since 1994. Paul McCartney performed at halftime, performing Beatles classics "Drive My Car", "Get Back", and "Hey Jude", as well as a firework-filled "Live and Let Die". In 2003 and 2004, $47 million in improvements to the stadium were implemented to prepare for the Super Bowl. These improvements included the addition of a unique sports bar in the south end zone called the "Bud Zone", a larger and wider video and scoring display from Daktronics, escalators in the north and south end zone, and a new "terrace suite" called the "Sky Patio" right above the "Bud Zone" in the south end zone. Before the 2005 season, mainly due to low attendance figures and looming blackouts, team officials installed a series of tarps to reduce the seating capacity for Jaguars games. The covers were placed to block out seven sections in the upper north end zone and four in each upper deck section, located on the corners of each. This puts 9,703 seats out of service, leaving the stadium with 66,851 seats for the regular season. However, in the event the Jaguars make the AFC Championship Game, the stadium can easily be expanded to full capacity. Some believed that this was a sign that the city couldn't support an NFL team; the city is the second-smallest market in the league. However, the current capacity is actually very close to what Wayne Weaver included in his original proposal to bring the Gator Bowl up to NFL standards. The city council turned this plan down, mainly out of concern for not having enough seats to accommodate the annual Florida-Georgia game. Despite the changes, however, blackouts have still occurred, including two of their first three home games in 2007 and nine of ten games in 2009. It is believed that the 2008 US Financial Crisis played a major part in the 2009 season blackouts, leading to insufficient ticket sales, with only the final home engagement of the regular season, with the Indianapolis Colts, managing to sell out. However, the Jaguars' 2010 season saw a huge turnaround in ticket sales, with no games being blacked out that year. The Jaguars have avoided blackouts in all games in 2011 and 2012. For the Super Bowl, Florida–Georgia game, and occasionally the Gator Bowl, temporary bleachers are put up in the south end zone and the tarps are removed, raising capacity to over 84,000. The attendance record was set on September 29, 2007, when 85,413 watched Florida State defeat Alabama in what was dubbed the River City Showdown. Each school received nearly 36,000 tickets, and the Gator Bowl Association added 5,800 seats. On July 26, 2010, naming rights to the stadium were bought by EverBank, one of the nation's largest privately held bank holding companies with approximately $11.2 billion in assets. On August 10, the deal was officially approved by the Jacksonville City Council with a 14-3 vote. Every year EverBank Field hosted Advance Auto Parts Monster Jam in February and Monster Energy AMA Supercross in March. In November 2013, Jacksonville's City Council approved $63 million in improvements to EverBank Field that Jaguar owner Shahid Khan helped finance $20 million of the cost. Renovations included two end zone video scoreboards 362-foot-long that are the largest HD LED of their kind in the world, a platform area in the north end zone with two wading pools, unique food and beverage offerings, interactive activities, and 55,000 square feet of HD video screens, which is a world record for a stadium. Construction of the platform resulted in the removal of approximately 7,000 seats, though temporary seating can be installed for major events that will require a larger stadium capacity. During the construction a live webcam was set up to view the progress of the new video scoreboards. The scoreboards were publicly unveiled on July 26, 2014. In the middle of 2016, the Jaguars and the city of Jacksonville announced $90 million in improvements to the stadium. Phase 1 includes the improvements to club seating, sponsored by US Assure, new walkout patios at the 50-yard-line and the creation of a new south end zone tunnel that will be the new team entrance and create two new seating environments. Phase 2 will include construction of a amphitheater and covered flex field; both phases are anticipated to be completed in May 2017. 1 2 3 "Everbank Field". Ballparks.com. 1 2 Carlyon, Hays (August 1, 2016). "Jaguars Unveil Re-Imagined EverBank Field with $26.6 million US Assure Club Renovation". The Florida Times-Union. Jacksonville. Retrieved August 21, 2016. ↑ "sports.html". 15 January 2002. ↑ Snook, Jeff. "UF-Georgia negotiations start today", The Palm Beach Post. January 12, 1993. Page C1. ↑ Florida Sun-Sentinel staff reports. "College Football", South Florida Sun-Sentinel. January 22, 1993. Page C2. ↑ Palm Beach Post staff reports. "Georgia may move '96 game to Athens", The Palm Beach Post. February 18, 1993. Page C8. ↑ Sun-Sentinel staff and wire reports. "Sports in brief", South Florida Sun-Sentinel. March 4, 1993. Page C2. ↑ Dame, Mike. "Florida-Georgia moving for '95", The Orlando Sentinel. March 23, 1993. Page D1. ↑ The Associated Press. "Gator Bowl gets funds for repairs", St. Petersburg Times. May 12, 1993. Page C6. ↑ Harry, Chris. "Gator Bowl plan OK'd to delight of UF, Georgia", The Tampa Tribune. May 12, 1993. Page Sports 5. ↑ Tampa Tribune staff. "Pro football", Tampa Tribune. May 14, 1993. Page Sports 2. ↑ Banks, Don. "NFL expansion a fleeting dream for Jacksonville", St. Petersburg Times. July 2, 1993. Page C1. ↑ Tampa Tribune staff report. "TD Jax! pulls out of race", The Tampa Tribune. July 22, 1993. Page Sports 9. ↑ Sun-Sentinel staff. "Jacksonville back in race", South Florida Sun-Sentinel. August 25, 1995. Page C6. ↑ Snook, Jeff. "UF could host 1994 Georgia game", The Palm Beach Post. September 1, 1993. Page C9. ↑ Browning, Michael. "Fantastic finish wins NFL team for Jacksonville", The Miami Herald. Dec. 1, 1993. Page A1. ↑ The Associated Press. "Groups criticize contractor's plan", South Florida Sun-Sentinel. December 25, 1993. Page A26. ↑ "Daktronics Photo Gallery: Jacksonville Jaguars, Jacksonville Municipal Stadium". ↑ "Lee comes off bench, rescues Florida State from Alabama". ESPN. September 29, 2007. Retrieved December 28, 2010. ↑ "EverBank buying naming rights to Jacksonville Municipal Stadium". ↑ Mitchell, Tia (August 10, 2010). "City Council OKs EverBank Field deal". Jacksonville.com. Retrieved August 10, 2010. ↑ DiRocco, Michael. "Jaguars unveil mammoth video boards". ESPN.go.com. ESPN. Retrieved October 8, 2014. ↑ Jaguars: 'Not everything is bigger in Texas'. Retrieved 16 July 2014. ↑ Bibber, Ryan Van (27 July 2014). 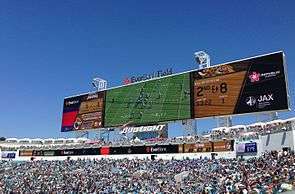 "Jaguars unveil world's largest scoreboards at EverBank Field". SB Nation. ↑ "1995 Jacksonville Jaguars Media Guide" (PDF). Jacksonville Jaguars. 1995. p. 154. Retrieved August 21, 2016. ↑ "2003 Jacksonville Jaguars Media Guide" (PDF). Jacksonville Jaguars. 2003. p. 345. Retrieved August 21, 2016. ↑ "2005 Jacksonville Jaguars Media Guide" (PDF). Jacksonville Jaguars. 2005. p. 362. Retrieved August 21, 2016. ↑ "2010 Jacksonville Jaguars Media Guide" (PDF). Jacksonville Jaguars. 2010. p. 262. Retrieved August 21, 2016. ↑ Barrabi, Thomas (November 10, 2014). "NFL London Ticket Sales: $32M Revenue From Wembley Stadium Sellout Crowds, Report Says". International Business Times. Retrieved August 21, 2016. ↑ Stellino, Vito (September 2, 2015). "Jaguars Got Better TV Ratings for Two Home Preseason Games Than for Road Game". The Florida Times-Union. Jacksonville. Retrieved August 21, 2016. Wikimedia Commons has media related to EverBank Field.